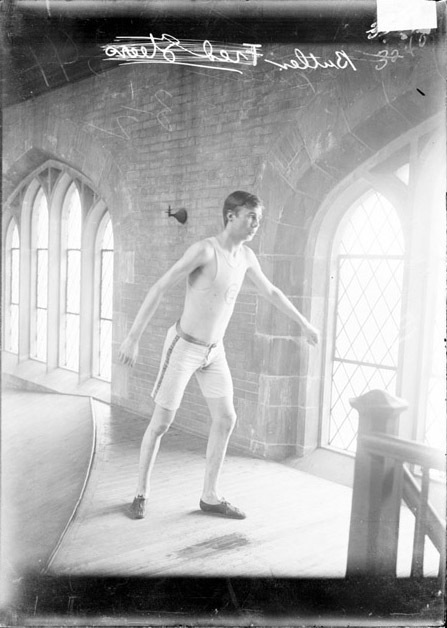 Title [Athlete, Butler, standing in relay position by the indoor track, Bartlett Gymnasium] [graphic]. Collection summary Full-length portrait of Butler, athlete, standing by the indoor track in the University of Chicago's Bartlett Gymnasium which was located at 5640 South University Avenue in the Hyde Park community area of Chicago, Illinois. University of Chicago Track and field. Hyde Park (Chicago, Ill.) 1900-1909.